Are you sitting down? Please do, brace yourself, because the truth can be disturbing. If you're under the age of 30, Barack Obama just stole your future. President Barack Obama lied to every single one of us about his tax agenda, with a straight face too. Don't get me wrong, I did warn you this will happen. Yet we're told this record spending is "necessary," because we’re in an economic crisis! President Obama, in his pursuit of liberal big-government spending, his every remark and the constant preoccupation of his Cabinet is to heighten the sense of crisis and to escalate the predictions of doom if we do not do as they tell us. Obama warned of “hazards and reverses” the economy will face, stressing grim economic statistics and warning of economic “catastrophe” if the stimulus failed to pass. Indeed, it was President Obama, not the markets themselves, who helped spread this fear. And now, every time he speaks, Obama sends the markets down and stocks crashing. But wait! What about transparency? President Obama promised the federal government would be more open and transparent, and that all legislation would be available for 5 days of public review. The House voted unanimously to allow a 48-hour public review. However, somehow, the transparency and "public review" was never allowed to happen. Obama lied. Transparency became a meaningless phrase of the past. $2.8 billion for the US Department of Agriculture in a misdirected program more likely be spent to build unnecessary broadband internet services in urban areas than in the rural areas that lack service. I just threw up, a moment please… I promise, it gets better – err, more appropriately, it gets much worse. Obama promised $300 billion to $400 billion in infrastructure spending; but instead, congressional Democratic leaders Nancy Pelosi and Harry Reid fill the bill with pork barrel spending - we got just $30 billion. The jobs that were supposed to be created and the business that was supposed to be “stimulated” likely won't happen. At least, according to Obama, there's no guarantee the $1 trillion gamble with our money will create any jobs at all. The infrastructure spending is far less than promised, there’s no solution for the housing crisis, no plan to save the banks, and the market knows it. Other economists agree, too. The irresponsible spending doesn’t end there, Pelosi’s next wave of pork got approved by Obama as well; President Obama's $3.6 trillion budget plan will boost federal spending across the board - and all of us will pay for it with tax hikes of $1 trillion on individuals and businesses over the next decade. Barack Obama's budget will cost each taxpayer $25,573.48, and it will take 10 years for taxpayers to fund Obama's tax hikes proposed for FY 2010. Barack Obama's agenda includes a Capital-gains tax increase from 15% to 20%, an agenda that begins 2011, and a scar on our nation that will last until 2021. 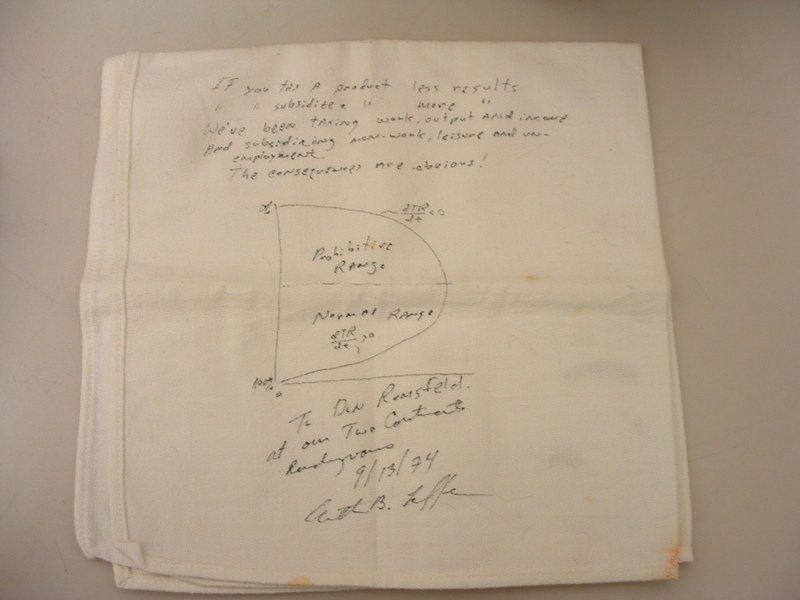 I’m willing to bet it doesn’t end there either, since Obama continues to prove he doesn’t believe in the work of Arthur Laffer, a young economist, who drew a curve on a napkin in a Washington bar. The Laffer curve suggests that, as taxes increase from low levels, tax revenue collected by the government also increases for a short period of time, but at some point further increases in tax rates would cause revenue to fall (for instance by discouraging people from working), thereby reducing tax revenue. Eventually, if tax rates reached 100% (the far right of the curve), then all people would choose not to work because everything they earned would go to the government. Some economists said that most governments could raise more revenue by cutting tax rates, an argument proven in the 1980s by the tax-cutting government of Ronald Reagan. Under Reagan, marginal tax rates were cut from a top of 70% to 28%. Revenues (from all taxes) to the U.S. Treasury nearly doubled. According to the Budget of the U.S. Government, Office of Management and Budget, revenues increased from roughly $500 billion in 1980 to $1.1 trillion in 1990. Not surprisingly, Obama laughs at the Laffer curve; in fact, the name “Obama” and “Laffer” should never be used in the same context, since the two ideologies are quite opposite from each other. This leads us to where we are now, a new era that looks to erase all positive legislation since the Reagan-era. House GOP leader John Boehner of Ohio said, "The era of big government is back, and Democrats are asking you to pay for it. [Obama will] continue to pile debt on the backs of our kids and grandkids." Since Big Government is back - so are big taxes. America, we just got scammed! With Obama’s lies combined with Pelosi’s reckless approach to Governance and spending, our hope for opportunity and an improved economy died. Barack Obama, a Democrat, promised to get the red ink under control even as he planned new spending priorities that eerily resemble the ideals of socialism. He wants to reward bad behavior with income redistribution, taking from the hard working Americans and giving it to the needy. With oncoming increases in taxes across the board, the government will lose the tax revenue it would have made had it allowed small businesses to afford employee’s to remain in the labor force; thus, more people paying taxes at a lower rate. Money invested in businesses will shrink since working citizens won’t be putting nearly as much of their income into a 401k or other investment vehicles; moreover, consumption will decrease and hurt local economy’s that depends on it. So where does all of this leave us? What can we expect, or at the very least, hope to expect? Will Obama’s stimulus package spark a much-needed rebound in the second half of 2009? Cramer said during his special State of Cramerica show, President Obama needs to fix the financials before we see a full recovery. It doesn’t matter how well the rest of the market’s holding up. Everything depends on the banks. In short, Cramer created an Obama Accountability Index, consisting of Bank of America, Citigroup, Caterpillar, General Electric, General Motor, and JPMorgan chase, to track the new president’s progress. To bet with Obama, you buy these stocks. To bet against him, you short them. This index will grade Obama’s success as president. If he fails, Cramer said, so does the stock market. Democrat control = Bear Market and Recession. Republican control = Bull Market and Prosperity. Let's face it, we're in a recession. It's tough to stay motivated during your darkest job search days. People are losing their jobs, and other employment opportunities are becoming more and more difficult to obtain. And crummy unpaid internship positions at for-profit firms appeal to just about nobody -- except, of course, for young people who need the experience and are still in college. Due to our current downturn in the economy, if you're unemployed or simply on the lookout for a new job, every chance at being hired is increasingly important. In a sense, missing out on a single opportunity to land the job you want could mean another month--or possibly longer--of job searching. So what can you do to maximize your chance of being hired during a job interview? I've compiled a list of the top five things NOT to say during a job interview, as these can quickly wreck your chance at being employed. Starting with number five. 5. "How long until I get a promotion?" Employer interpretation: Ask not what I can do for you. What can you do for me? Why: Asking questions about salary or benefits prior to getting a job offer is a major turnoff. Come across as overly aggressive and you may scare the interviewer into rejecting you. Tip: Slow down. you want to show you're goal-oriented, but you don't want to come off as entitled, or ready to leave a job you don't even have yet. Let the prospective employer initiate salary discussions. It is OK to give a range, or to ask what they feel the range is for the position. However, it can be a turnoff if you are the one to initiate the subject of salary. Ultimately, you want to be seen as someone who focuses on getting the job done. 4. "I don't have any negative points." Employer interpretation: I'm not completely open or honest, nor will I play your game with a full deck. Just hire me, then you'll find out. Why: The interviewer wants a straight answer. Tip: Mention one noncritical area you'd like to polish, then explain how you are working to improve a weakness. Another angle is to explain how it is negative and also positive. For example, "Once I start a project I throw myself into it and sometimes neglect personal obligations. I have to keep myself in check to avoid burnout." 3. No. I don't have any questions." Employer interpretation: I could care less -- but not much less. Why: Candidates who leave without underscoring their great interest in being hired are quickly forgotten. You don't want an awkward silence when asked if you have any questions. Speak up. Tip: If you do your homework about the company you're interviewing with, you'll have lots of questions. This carries over into number 2. 2. "I don't know anything about the company." Employer interpretation: I'd rather watch the worst of Late Night TV than research your company. Why: If you're not interested in the company, why should the company be interested in you? Tip: Before the interview, visit the employer's Web site to learn as much as you can about the company. When answering this question, focus on one or two flattering items to explain why you want to join this particular company, such as recent new business the company has landed or write-ups about the firm in trade publications. 1. "I hated my last boss." Employer interpretation: I'll be a huge drain on company morale. Why: A negative attitude regarding your current or past employers or colleagues will make your stock drop. No good can come from talking down your past employers. You run the risk of seeming like an employee that may be a "management problem." Tip: Even if you did dislike your previous boss, trash talking isn't going to get you far in an interview with a new one. Instead, if you need to talk about why that situation didn't work for you, try to describe what type of management style you respond best to. Keep the answer positive, in terms of where you want to go, not what you want to get away from. For example, “I’m ready for a new challenge” or a similarly positive remark. In 2008, many popular MMORPG's (which stands for Massive Multiplayer Online Role Playing Game) have created new meaning to online gaming addiction. For some addicted users (or shall I say ex-users? ), it prompted a need for procedures on how-to quit an MMORPG. Other MMORPG players are still on the lookout for the ultimate gaming experience; with which, one that doesn't consume an enormous amount of time to play but still offers the same excitement. During the year that was 2008, I did just that when I stumbled upon Travian. In my opinion, Travian is the Browser Game of the Year. Here's why. For a little background on this MMORPG, Travian is a browser game with a world full of thousands of users who all begin as the leader of a small village. As time progresses in Travian, each player may choose to grow and found new villages to expand development. Each game lasts approximately 9 or 10 months, so strategy is key to building your own successful village. Do you ally with your neighbor's - possibly joining an alliance with them? Or do you instead found an alliance of your own? Are you a peaceful king or thirsty for war? If peaceful, make sure to create ally's or a strong defense so you don't get conquered by enemy forces! Moreover, there are three tribes in Travian: Romans, Gauls, and Teutons. Each tribe has its own special advantages and disadvantages. The troop types are also substantially different between tribes. Because of these tribal traits, it's important to choose your tribe wisely! If you're unsure which tribe to choose, I personally recommend either Romans or Gauls. Romans are typically the most well-rounded, they are good at both defense and offense; Gauls are renowned for having the best defense in the game. Although not restricted to only the most addicted players, Teutons are known to be the best attackers in the game but can require more "real-time" to play. Coordinating a lot of attacks can take time to perfect, however, for the warriors out there it can be fun! The Teutons unit types are also the cheapest (in cost) to train, so for those that are thirsty for war you might like this tribe. Travian is the Browser Game of the Year, in part due to the ease at which one can learn the MMORPG's in-game play, but also because it isn't time consuming. For users who have lives outside the MMORPG, Travian won't force you to surrender your real life in order to fully indulge yourself in the game. In fact, there will probably be times when you wish there was more to do before waiting for the next building or resource upgrade, training more troops, or to attack another village! However, don't confuse more free time with little to do when playing Travian, this game can be addictive! So check it out - your villagers await you. If you've played the game and agree with me, feel free to vote for it! This is one of my favorites for several reasons: it reminds viewers of the award winning Hyundai Brand name, and also keeps the audience interested by using funny, clean, and very clever humor. Most people can probably relate to the "Hyundai" Ad simply because the name truly is mispronounced a lot; however, now we also know "Win One Little Award And Everyone Gets Your Name Right." Awesome Ad! It's described as "Corporate bean counter proposes no Bud Light at meetings to cut budget." They kept it simple, funny, and it was one of the first Ads played during the Super Bowl. In my opinion, this is the best Bud Light / Budweiser advertisement aired. Google's "don't be evil" motto has been the target of the occasional critic. Hulu, however, has declared in its hyped-up Super Bowl TV ad that it is evil--and it's not making any apologies. To make this commercial all-the-more appealing, Hulu couldn't have picked a better star with veteran actor Alec Baldwin, who is currently in the cast of the NBC show 30 Rock. It's cute, grabs the attention of viewers, and the ad continues to reinforce the E*Trade Brand awareness campaign. I can't say for sure if this ad directly correlates with E*Trade's "1,000 new accounts per day" slogan, but I can say the E*Trade Baby provides the online broker with a unique Brand image that's positively increased the companies Brand Equity. 'Two nobodies from nowhere' craft winning Super Bowl ad - this is by far one of the more popular Ads aired during this years Super Bowl. In one word to descibe it, "Hilarious!" Founded by Bob Parsons in 1997, The Go Daddy Group has grown to include more than 32 million domains under management. GoDaddy.com is the world's largest domain name registrar and is the flagship company of The Go Daddy Group, Inc. While the Go Daddy Super Bowl Ads have been known to show "content that is fun, edgy and just a bit inappropriate for some individuals," the 2009 Super Bowl advertisement lacks attitude and an objective goal for its intended audience. After watching the ad, many viewers were left laughing but still somewhat unsure what Go Daddy is; moreover, questions may linger, viewers asking themselves what does the ad want us to do, and what are the intended viewers supposed to think after watching the ad? However, if there's one thing I'm sure of it's that the commercials they show during the Super Bowl are HOT! Click here to go see GoDaddy's TV Ads!